To briefly recap, I created this series to be a monthly tribute with a design based on the birthstone and birth-flower. 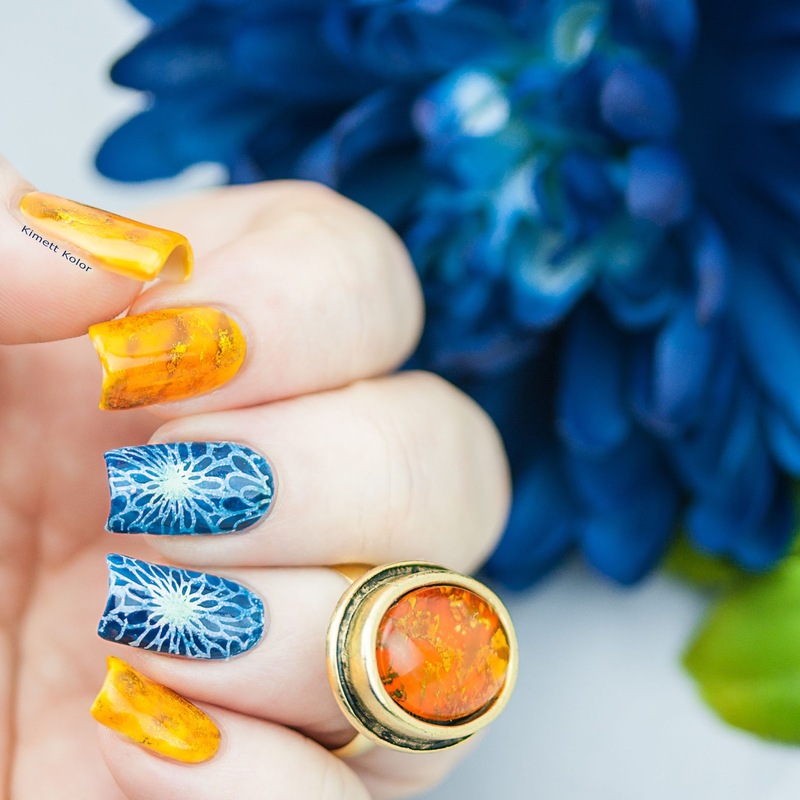 I set up the structure of having my outer nails represent the birthstone, while my two inner nails depict the birth-flower. Usually, I’ve used a single color or an abstract way of portraying the gemstone. Then I’ve either stamped or free-hand drawn an image for the flower(s). If you’d like to revisit the posts again — or check them out for the first time — you can follow this link: Theme of the Month posts. My sincere apologies to the November babies for not getting this posted at the beginning of the month — but, here is my belated Happy Birthday to you!! 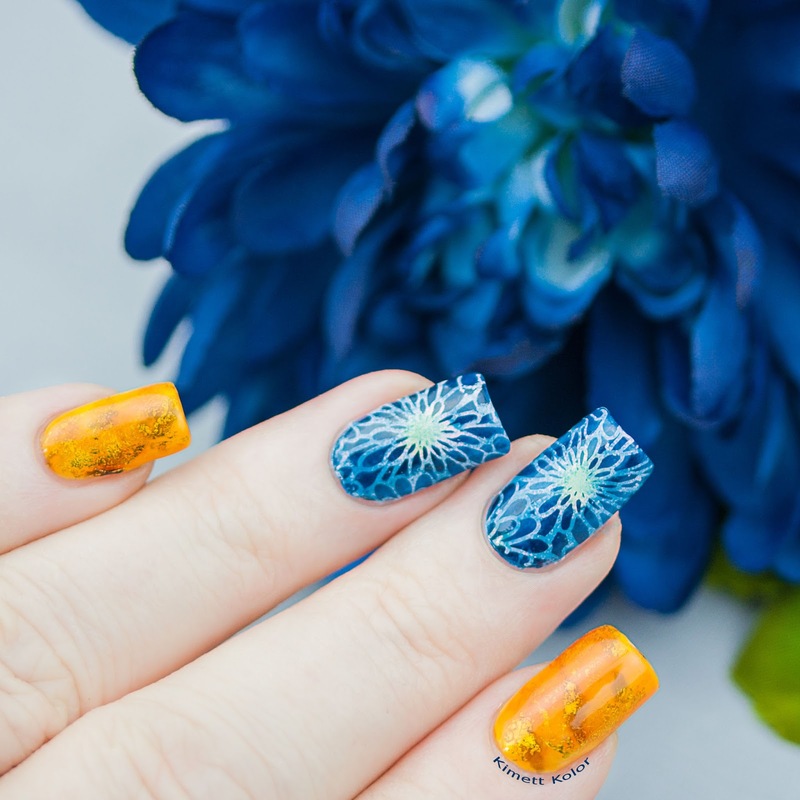 In planning these nails, I came across this graphic that showed the chrysanthemum for November can be blue, red, or yellow. Oooh! I know that blue is not a common color for mums…so I thought it would be fun to do something outside of the traditional color theme. I kinda think blue should get more attention in the Fall anyway. 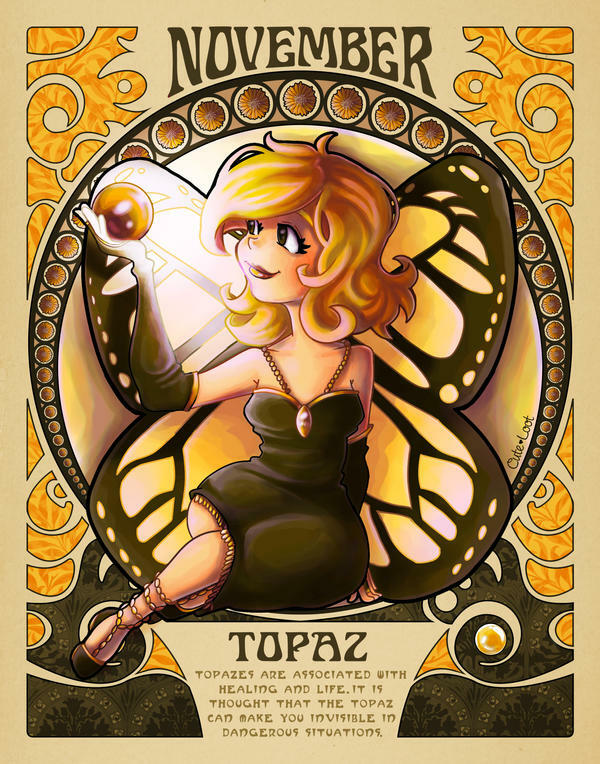 And, I also read that orange topaz is considered the most precious of the topaz colorations. So, again, being a fan of color, that seemed to fit well with my idea. 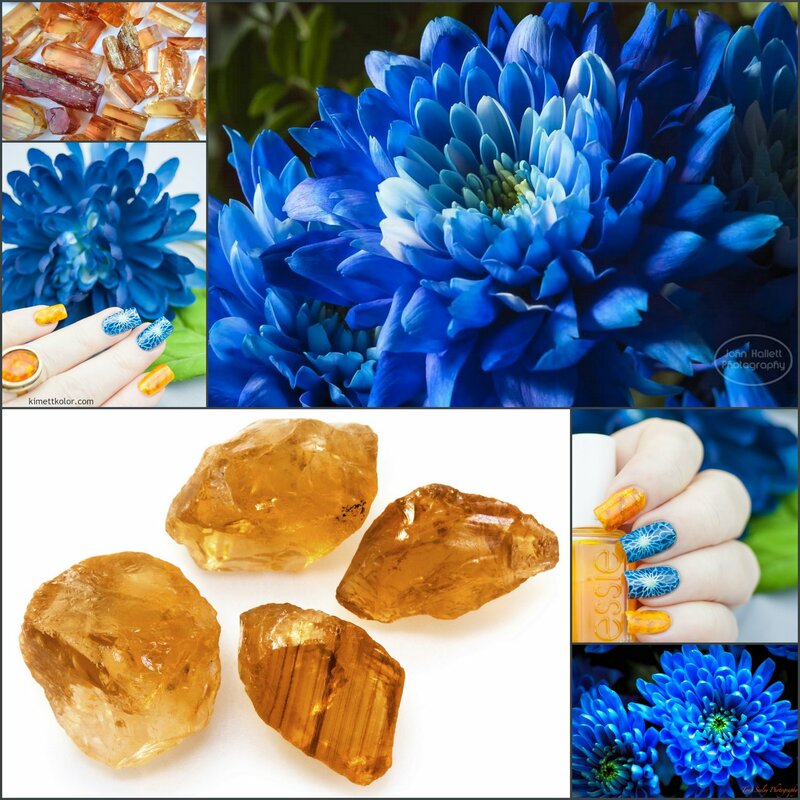 It also seems to have become a popular color of topaz (along with Citrine, the other November gemstone) and lately, there seems to be this shade in lots of jewelry pieces. I don’t know about being invisible (sounds good though!) — but I liked this graphic. You’ll find at the end of this post more Inspiration Source photos which will give you an even clearer picture of my design plan. 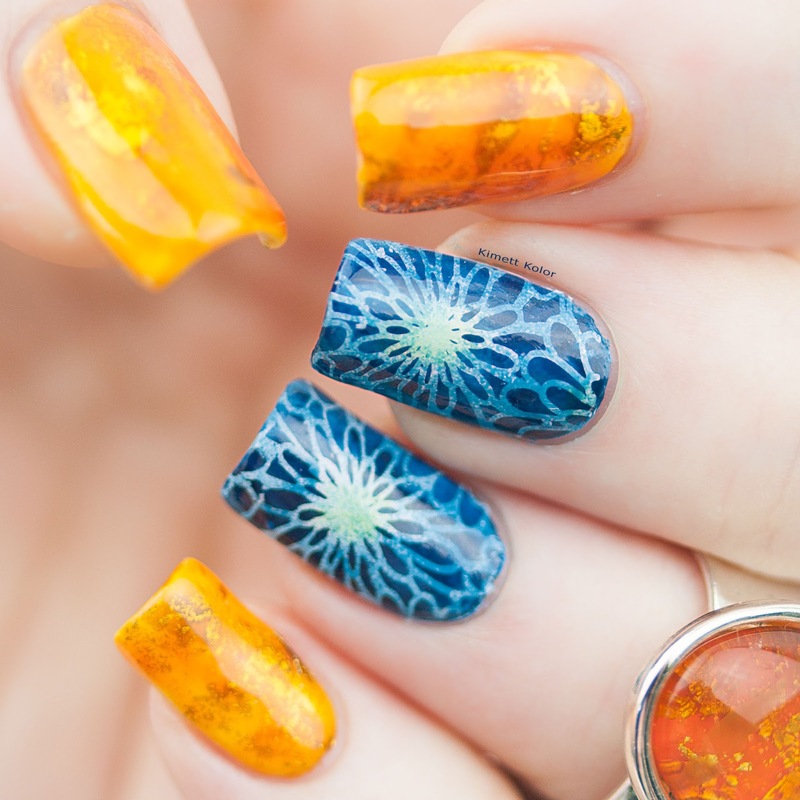 Of course, there are things I wish had gone differently with this nail art look. Yet, overall I’m pretty pleased with the outcome. It felt good to be “back in the game”. I know I’ve said it before, but I have really enjoyed doing these monthly designs. As you may have guessed, there were quite a few layers to these nails. And, thanks to a friend’s reminder, I stopped and took quick cell-phone shots at each step. This might make explaining my process a little easier with references. 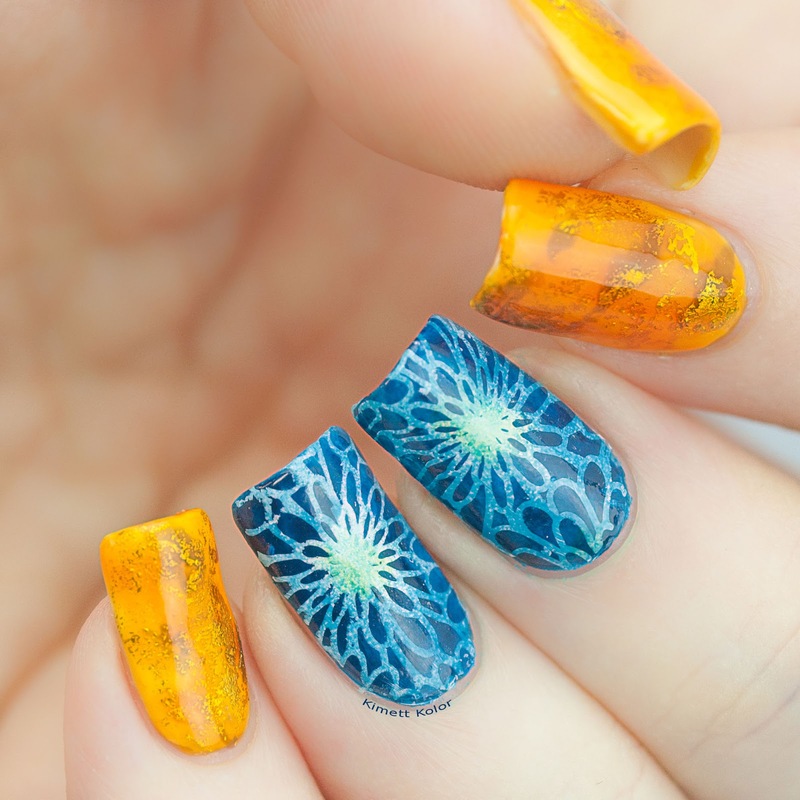 I used three polishes applied randomly to a make-up sponge for the blue base – messy! And painted on the yellow jelly polish on the outer nails. Next, I removed the latex and did a rough clean-up with acetone. Using a small foil glue bottle brush, I haphazardly applied it in a similar manner as dry-brushing on the yellow nails. While waiting for that to dry, I applied a thin coat of a deep blue jelly over the blue nails to darken and soften the look. Then, I applied the gold foil to the nails, trying to get only random jagged edged sections on my nails to give the topaz nails a crystalline appearance. I applied one coat of orange jelly to the topaz nails. I stamped the flower image in white on the blue nails. 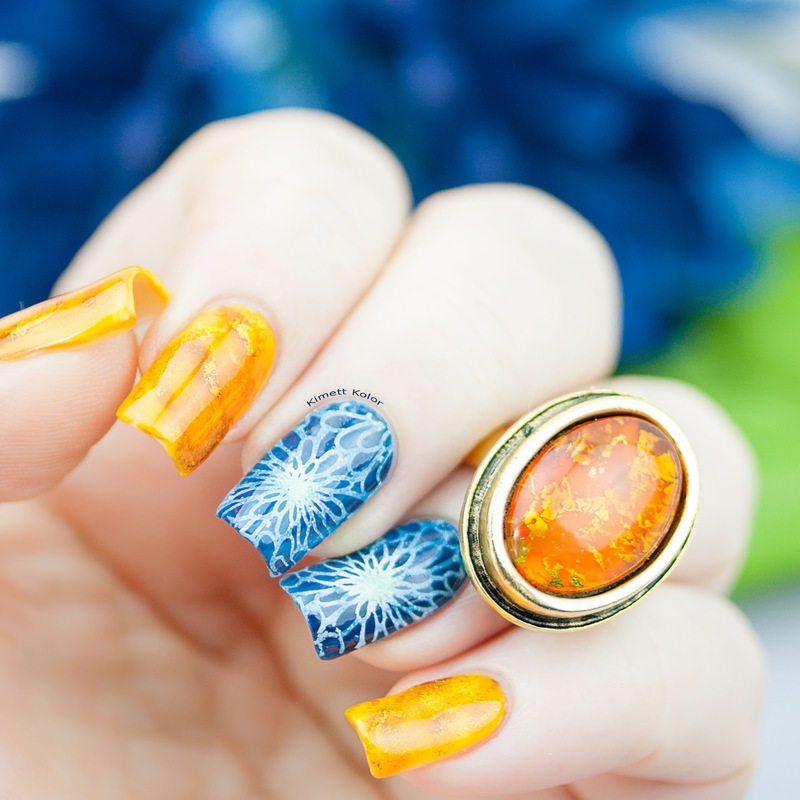 And I also added some random yellow jelly strokes to the topaz nails. 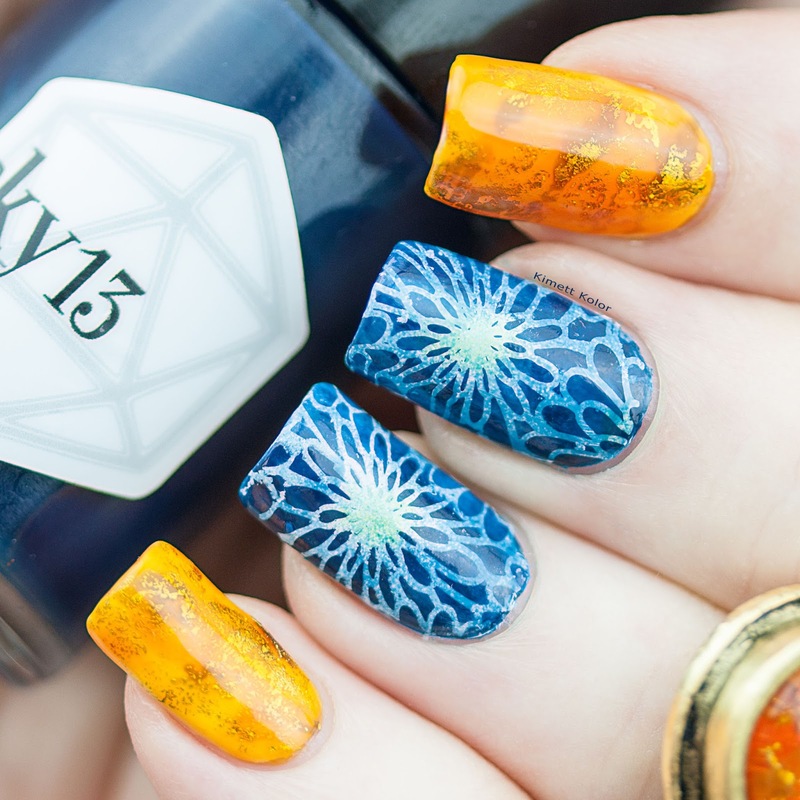 Using small pieces of a make-up sponge, I lightly sponged on the dark blue jelly over the stamping, with a touch of dark teal jelly over the centers. 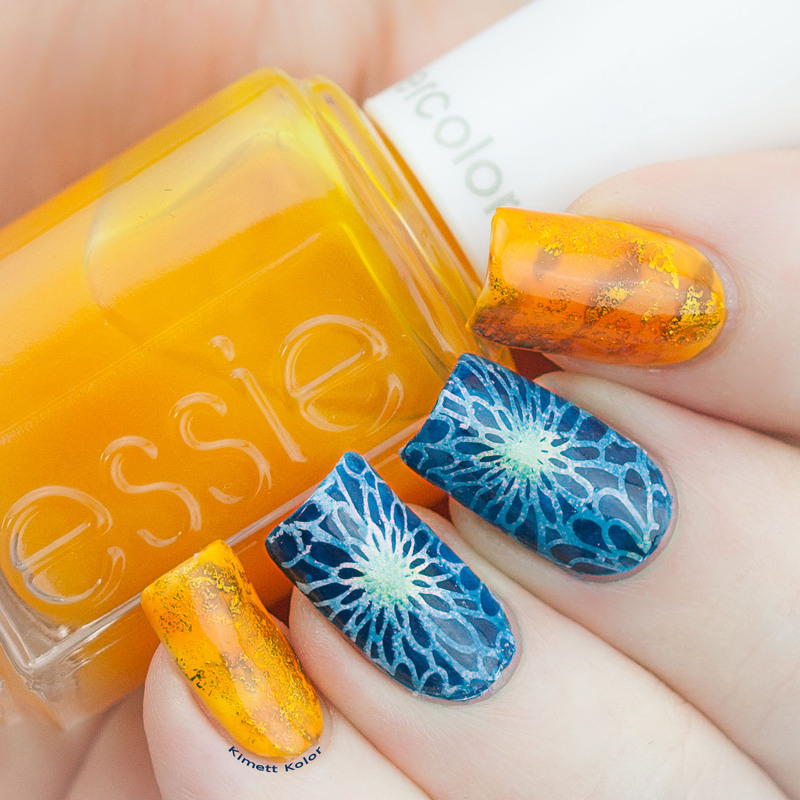 This made the stamping look less crisp, but that was the look I wanted. Also, I applied another coat of the orange jelly on the topaz nails. I finished everything off with top coat and a final round of clean-up. I really had a blast thinking up these steps, tinkering with different things ahead of time. Actually, I was a little bit of a mad scientist, part artist, and a messy child all in one. A fantastic combination, if you ask me! Those of you who know me well, I get very giddy when I get to use my beloved jelly polishes!! They’re my favorites. 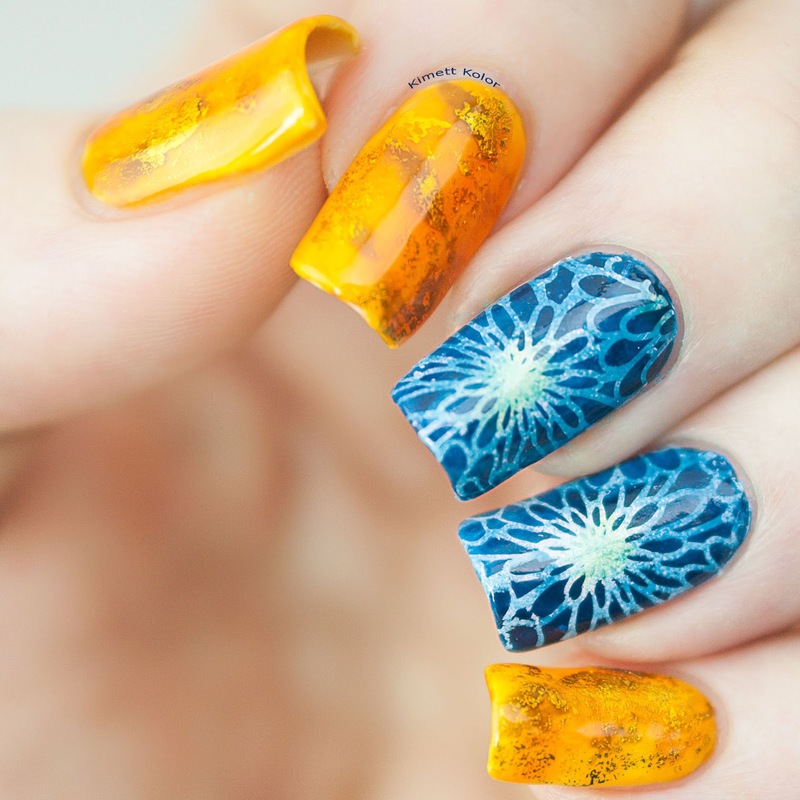 For these nails, probably DIY jellies would have done the job. But, I really get excited when I find jelly polishes that have great formulas already made. There is that magic balance of clear non-goopy base and just the right amount of pigmented color….pure bliss!! All but one of these have formulas I would recommend, but they are from older collections and not available at this time. Sorry. (Although, I think you can find the Essie at some online sources though.) I experienced problems with the orange one from L’Oreal (just like I did with the lilac one in this lace design). They worked fine when they were new, but don’t appear to be holding up (not the usual thickening that can be solved with polish thinner), so I’m going to remove this “Miss Candy” collection from my stash and no longer use them. There are a million ways to go about these themed designs (maybe I’ll do them again?!?). This time I went with the more abstract representations. Instead of using a realistic image of a chrysanthemum and/or using a cut and shaped gemstone look, I went with these “idea of the thing” rather than depicting the things themselves. Does that make any sense? Or am I babbling too much? And…tell me please…What do YOU think? Regardless of the design details, do you think I made a fun nail art look? Thanks for letting me share my creative outlet through this blog with you today!! It’s great to have your support!! —-> Enjoyed this post? 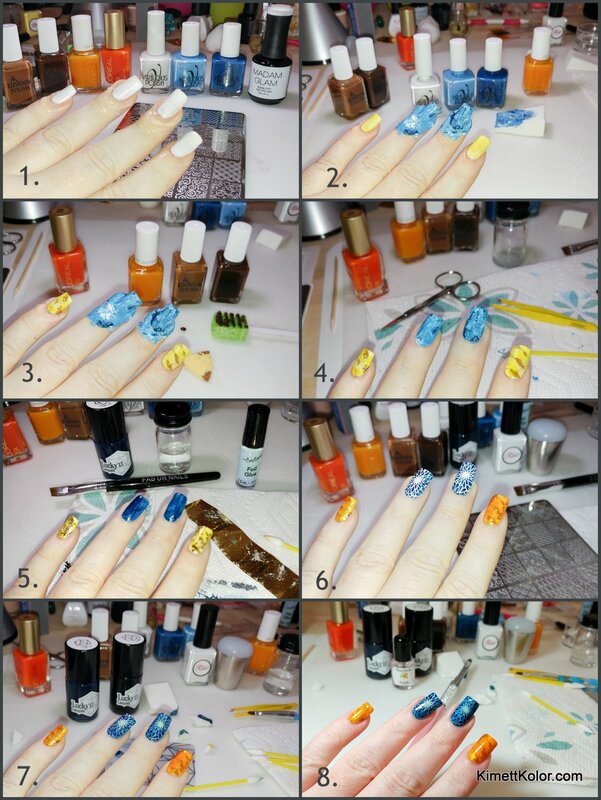 For more Theme of the Month nail art, click here.